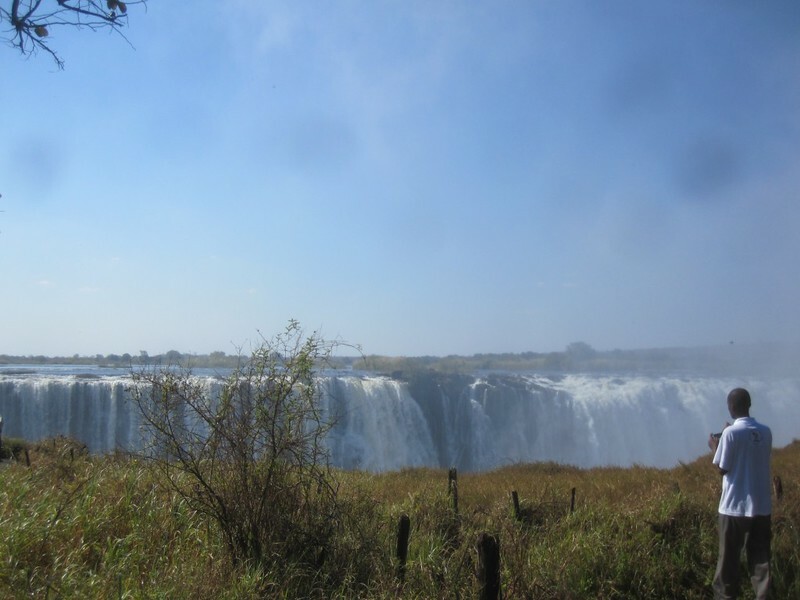 Livingstone, Zambia is a totally different experience than Victoria Falls, Zimbabwe. Victoria Falls is a true tourist town. There’s not much outside of tourism. Livingstone, however, is much more than a tourist town. There’s industry and employment outside of tourism. It’s also much larger than Victoria Falls. Plus, Livingstone is located about six miles from the actual falls themselves. Victoria Falls, Zimbabwe virtually sits on the falls. I walked to the falls several times from the center of town. It was less than a mile. 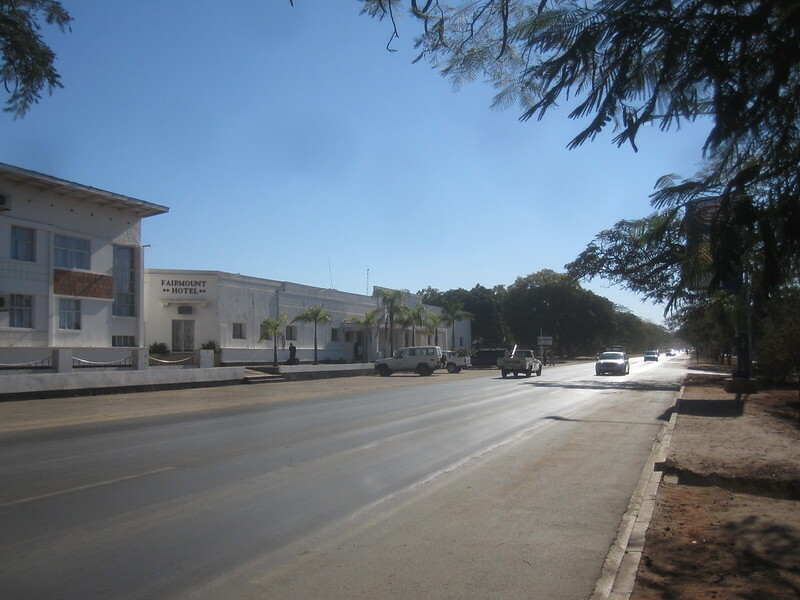 This picture is of the main street of Livingstone. It is looking away from the busiest section of downtown. This entry was posted in Travel and tagged Africa, Overland Trip, Zambia, Zimbabwe on July 10, 2012 by Steve. I had to go. It cost me about $50 to officially go to Zambia. Technically, I could have walked past this sign and have been in Zambia, but I needed the stamp to show that I was officially in the country, not just an illegal immigrant. 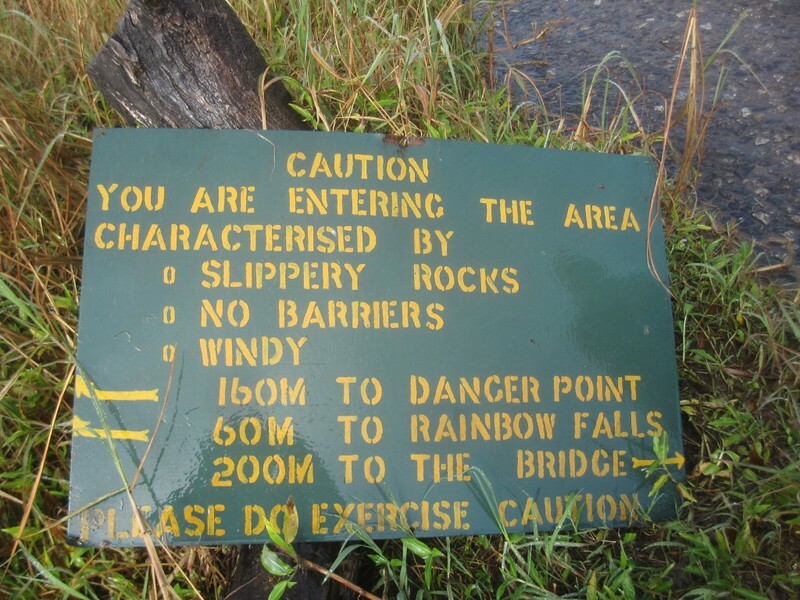 This sign was on the bridge where the bungee jumpers jumped out over the gorge. It was halfway across the bridge. Note that the bridge is a one-way bridge for cars and it is also a bridge for trains. But more than that it is a bridge for thrill seekers. I don’t know why but I often get invites from Africans to sit in on their pictures. Normally I just comply. This time I asked the photographer to take a picture for me, too. I just assume that the locals want a good-looking white guy in the picture to dress it up. All kidding aside, though, I’ve found that Africans are some of the friendliest people I have encountered. They talk to me all the time and I’m glad to talk to them also. I’ve found that people of the third-world are just like people of the first and second world. If you treat them nice, they will treat you nice also. 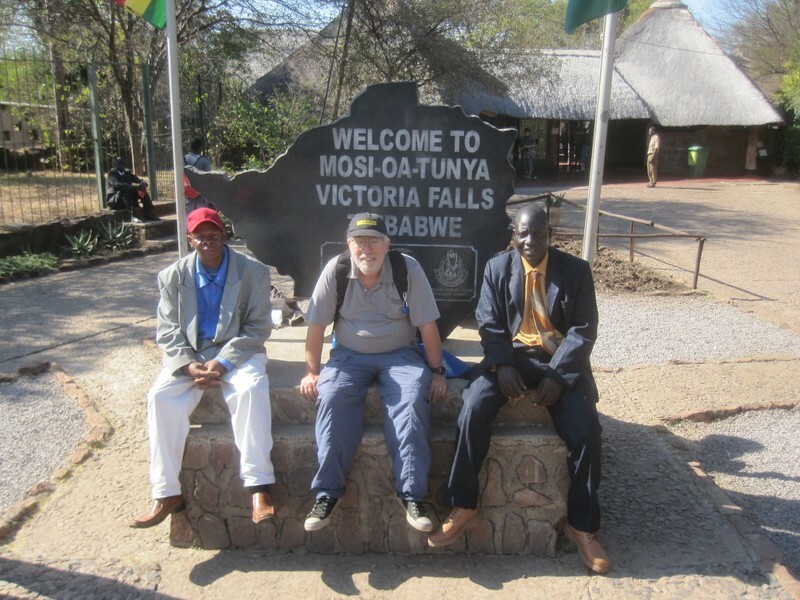 I came to find out that these two fellows were from Harare and were visiting the falls with one of the fraternal organizations to which they belonged. Note that the largest dimension available for this picture is 1024 X 768 as it was uploaded at a very slow bandwidth from a remote location in Africa. This entry was posted in Travel and tagged Africa, Overland Trip, Zimbabwe on July 6, 2012 by Steve. Victoria Falls can be really dangerous. There are sections of it that are perpetually wet. There is a rain forest in front of the falls due to all of the mist that rises from the falls. There are certain areas of the falls that are not as protected as other areas. There were times when I did not need the raincoat and times when I was really glad that I had it on. Note that the largest dimension available for this picture is 1024 X 768 as it was uploaded at a very slow bandwidth from a remote location in Africa. It’s what I came to the town of Victoria Falls, Zimbabwe to see. It is the world famous Victoria Falls. They are impressive. There are three serious falls in the world. They are the Niagara Falls in North America, Iguazu Falls in South America, and Victoria Falls in Africa. The falls at Victoria Falls are incredible. They are over a mile wide and it takes a long time to walk from one end of them to the other. The entry fee is $30 American. I had cheap lunch there which cost me an additional $10 and rented a raincoat at a cost of $3. My total cost for seeing the falls was $43. That’s a little pricey when you consider that it’s free to see Niagara Falls, which actually have more water flowing over them than Victoria Falls even though they are more narrow and less high. Note that the largest dimension available for this picture is 1024 X 768 as it was uploaded at a very slow bandwidth from a remote location in Africa. It’s Will (England) getting ready for the big plunge. There were a lot of males within the tour participants that wound up doing bungee jumps and zip-lining at the bridge over the gorge. 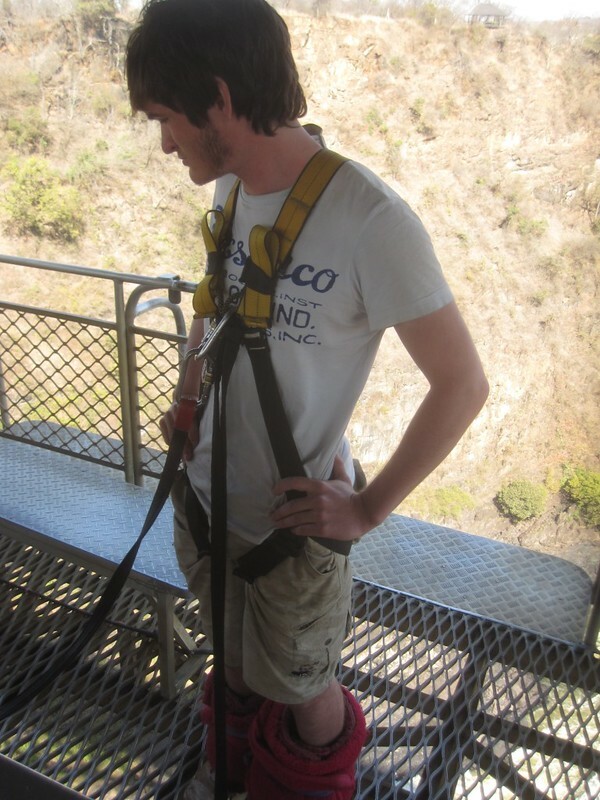 To my knowledge, there were no females that bungee jumped, but there were some females that zip-lined. All-in-all I think the group had a good time and wasted a lot of money. Note that the largest dimension available for this picture is 1024 X 768 as it was uploaded at a very slow bandwidth from a remote location in Africa. Okay, I admit it. I just had to rent the scooter. Mainly because I love to ride. It’s also a great way to see a location. I think it’s one of the best ways to get around anywhere. 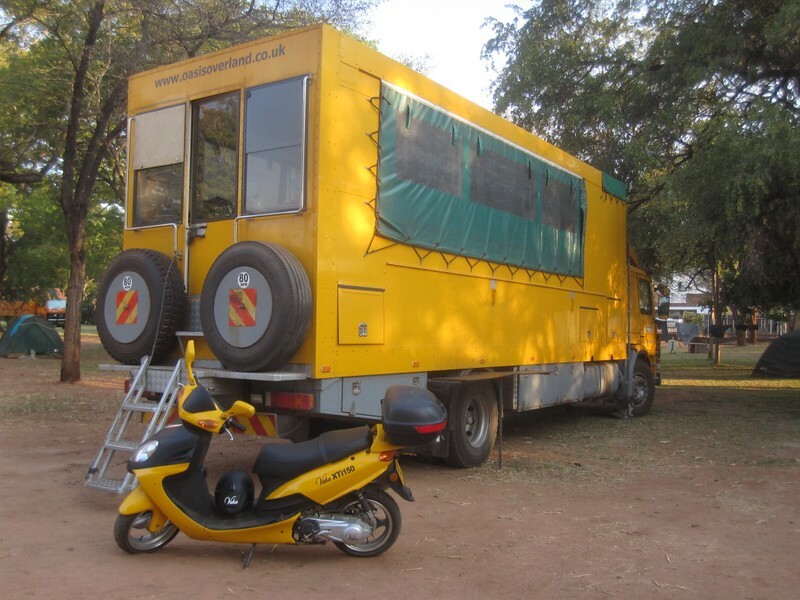 I rode around the town of Victoria Falls and got to see a lot of things other people didn’t because I had mobility. I could cover a lot more ground in two hour on the scooter than I ever could walking and feel a lot better about it afterward. It’s physically tough to walk around town all day. It’s easy to take a scooter ride for a few hours. There’s a reason I have a Honda Silver Wing parked outside my back door and it’s not to dress up my back yard, although the scooter does dress it up a bit. Note that the largest dimension available for this picture is 1024 X 768 as it was uploaded at a very slow bandwidth from a remote location in Africa. This entry was posted in Travel and tagged Africa, Overland Trip, Scooter, Zimbabwe on July 6, 2012 by Steve. It’s me on the bridge. I’m on the Zimbabwe side. 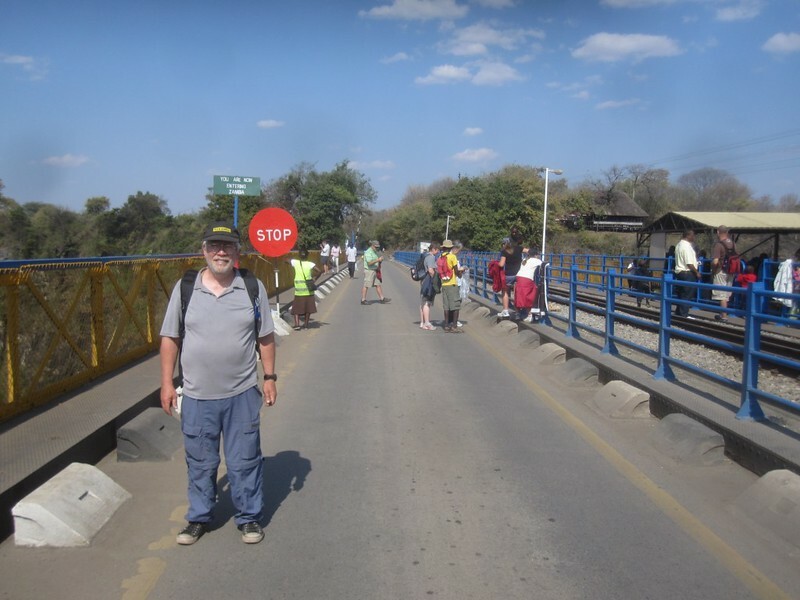 The stop sign behind me indicates that going past that sign means you are technically on the Zambian side. However, it really isn’t a problem until you get to the Zambian immigration desk and that’s quite a bit down the road. The sign also means that the bridge is one way. People from Zambia cross to Zimbabwe. Then people from Zimbabwe cross into Zambia. I liked the bridge, but it really is high up. There’s no way I would ever bungee jump off of this bridge. Actually, there’s probably no way I would ever bungee jump anywhere. Note that the largest dimension available for this picture is 1024 X 768 as it was uploaded at a very slow bandwidth from a remote location in Africa. This entry was posted in Travel and tagged Africa, Overland Trip, Zambia, Zimbabwe on July 6, 2012 by Steve. This is the Zambezi River after it has done it’s descent down Victoria Falls. This picture was taken on the Zimbabwe side of the falls. Nice gorge, huh? This is the gorge where the bungee jumping and zip-lining are done during the day. Some days, there are lots of people jumping off of the bridge. Other days there is no one on the bridge save for the lonely bungee jumping crew. 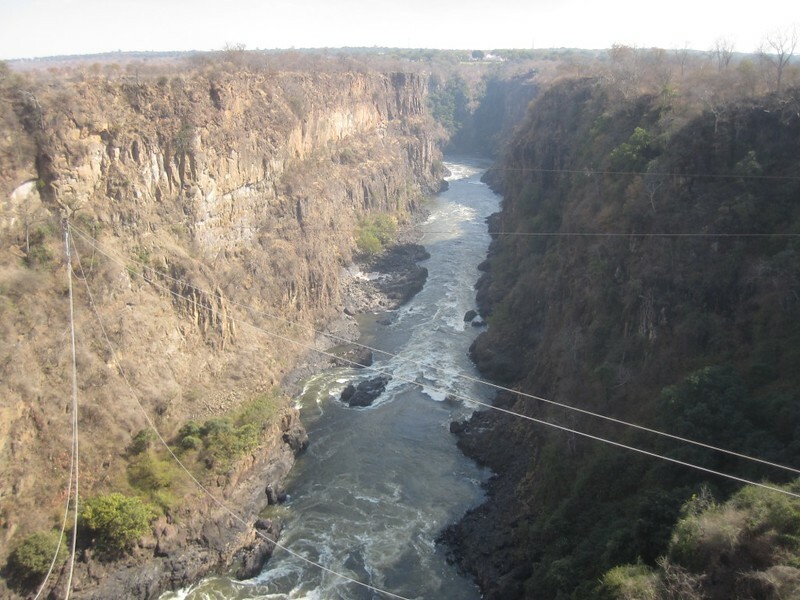 This bungee jump is world famous because a cord snapped on a jumper in January, 2012 and the girl wound up in the Zambezi River, which has a few crocodiles in it. When I went to the bridge the first time, there was no one there. 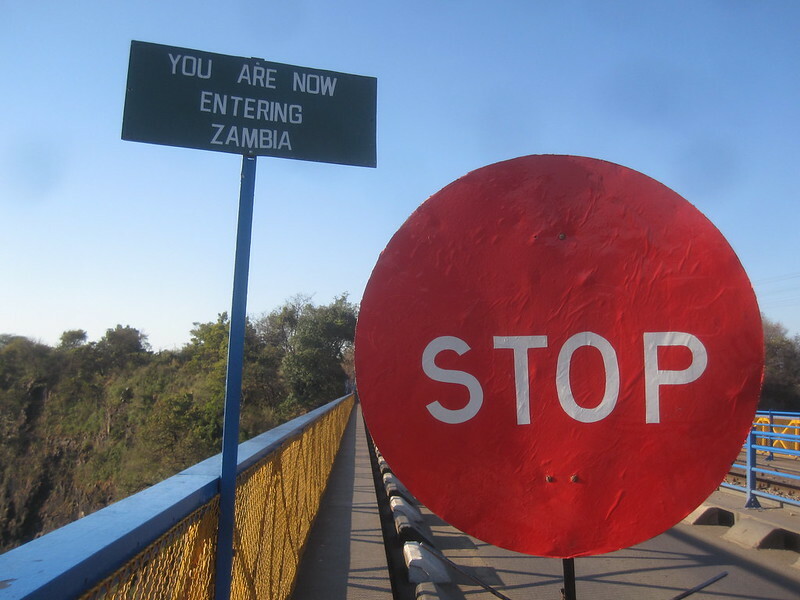 The bridge is in &quot;no-man’s-land&quot; – the area between the Zambia and Zimbabwe immigration offices. If you are just going to the bridge, you must pass through the immigration line of one country without passing through the immigration of the other country. Just say “I’m going to the bridge to watch people do stupid things.” The immigration officer will smile. Note that the largest dimension available for this picture is 1024 X 768 as it was uploaded at a very slow bandwidth from a remote location in Africa. It’s called Chicken Inn and I’ve eaten there several times. It is a chain restaurant and they have stores all over Zimbabwe. The best thing about them may be that you can get their products to go. 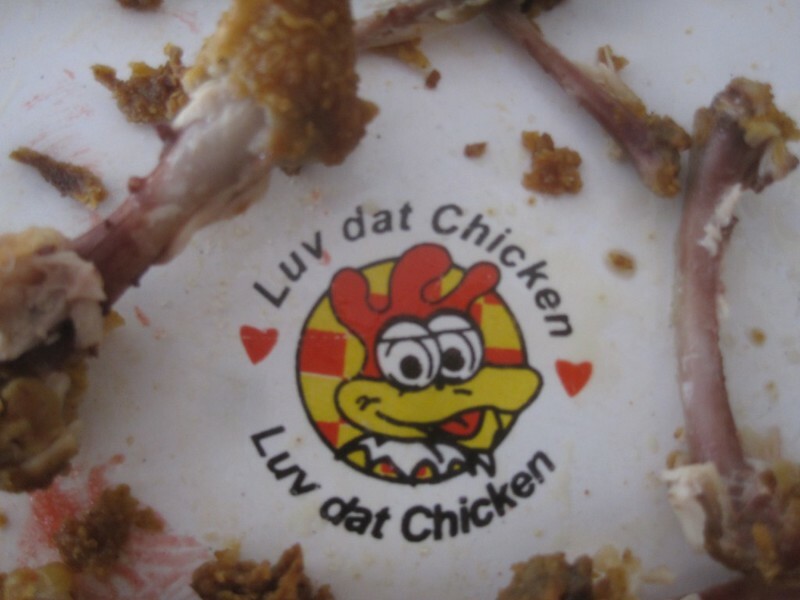 I know because I’ve seen the recd and white Chicken Inn takeaway boxes all over the the roadsides throughout the country of Zimbabwe and on most of the streets of the cities. They apparently haven’t discovered Adopt-A-Street yet in Zimbabwe. Chicken Inn chicken is not as good as the Colonel’s (KFC) chicken and it’s just as expensive. I only eat there because the dining options in Zimbabwe leave a little to be desired. Don’t get me wrong though, I like Chicken Inn chicken, it’s just that I I’d like to see a bigger variety of fast food in Zimbabwe and I’d like to have it be less expensive than the fast food in the United States. Then again. maybe I’d just like to see less truck food from the overland truck on my plate. Note that the largest dimension available for this picture is 1024 X 768 as it was uploaded at a very slow bandwidth from a remote location in Africa.